Dear friends this interactive swinging card is my Guest DT post for Digital Delights for winning the Petal Power challenge with my Mother’s Day Card. Delightful challenges holds a very special place in my heart as I won my first Guest DT post ever [back in 2011] with this Quilled Sunflower Girl…I was so nervous when I used their digital image [ first time I worked with digis ] in a Side step pop up card which was my first guest DT post and that card in turn won me a Guest DT at Crafty JC ! I used the super cute digital image "Relax Barnaby" from Digital Delights, 3D decoupaged him and suspended his hammock from palm trees in this tropical paradise themed swinging interactive card. My daughter is forever searching for her eraser and pencil sharpener during homework time and I had been intending to make a tray to hold her stationary...so I placed my interactive tent card on a cardboard box lid dressed up with glitter foam grass and handmade flowers. What is paradise without some flowers so added some quilled flowers and stamped leaves to my tent card. On the folded edge of an A 4 card mark a semicircle using a template [ use anything you have like a plate, lid, circle die,or even a foam tape like I used here]-- just make sure you leave 1 1/2 - 2 inches on either side so that your card remains sturdy! As an interactive card is going to be played with quite a bit you need a good sturdy base so that it doesn't topple over! I chose a 6 x 8 inch card [ you can play with measurements] and folded it in half [ center mountain fold] and then folded up [valley fold]1 inch on either side to get an accordion fold in the shape of a " W ". If you have a scoring board :score on the 6 inch side at 1 , 3 and 5 inch marks. The 1 inch folded parts of your accordion folded " W "are your gluing tabs.Apply glue to one gluing tab of the " w " as shown and stick it inside the tent card you had already made.Apply enough glue and pressure as its important to get a good adhesion here. Fold your " W " accordion and apply glue on the other gluing tab and firmly stick the other flap of your tent card onto it. The tent card on which your swinging element is going to be hung is ready! As a swinging element I 3 D decoupaged the cute honey bee by cutting him and layering using foam dots. Can you see the shiny flower centers and shiny nose and cheeks of the cute bee ? [ courtesy glossy accents] You can choose any swinging style image like a child on a swing or a hammock , a bird on a branch etc.Punch holes on either side and attach to the tent card with twine, thread or ribbon. You can actually make the image fit right inside the aperture so that it swings freely to and fro . Since both my clinic and home printers were acting crazy I had to depend on a printing shop to print my digital image and I couldn't get my image size a perfect fit but my little bee still swings happily ! Another tip : Do heavily embellish the base of the card like I have done with flowers galore or whatever you fancy and keep the top relatively simple as otherwise your card will topple over! I hope you like this interactive card which actually doesn't require any fancy tools to make. Absolutely gorgeous! Such a fabulous design and love the way you created the entire garden view! excellent work doc! Thank you so much Jaya it was a rush job as my printer went bonkers refusing to accept ink cartridges and I had to get the image printed from a shop at the last moment! Wow what a treat for the eyes! Love the theme and perfect execution. .you make me long for a holiday like this doc! Ha Ha actually we did have a lovely holiday amidst nature in Malaysia last year and I thought of that while making this card! Thank you so much Motidana...such sweet comments make my day!! Thank you Sonia for your nice comment about my treasure box :) I really appreciate your words! What a stunning creation you have done, so many details to look at, welldone! WOW Sonia! This is AWESOME!! What a fun card design and ADORABLE image!!! Love all your embellishing as well! Absolutely gorgeous creation Dr sonia ..I love the fun swinging element and the beautiful way you have embellished this card ..Its just wow !! Wow..will surely make one long for Holidays :D !! It would be fun to swing in between tress surrounded by such beautiful n colorful flowers !! Wonderful card , I love how you have dressed up the card n tray.Thanks for the easy to follow tutorial :) ! Thank you so much Pooja...its a super easy card to make.I actually wanted to make a pop up scene but didnt have time! Amazing....... did I already say Amazing! Wow Wow Wow, love this! Thanks for joining in the Corrosive Challenge this time around, it was awesome seeing your work! That's such a cutie beauty honey bee, Sonia. The garden is so fresh and evergreen...you rock the kids projects! Yourvdaughter must be more fhan delighted, hope things are in place now. Ha Ha maybe I rock at kiddy cards cos the kiddy actually gives inputs and big opinions when I make them!! What gorgeous and fun card design! I love all embellishments you have incorporated. Great tutorial too. Thank you for joining us at Try it on Tuesday . This BEE likes the Bee intereactive swinging card. Thanks for the step by sstep instructions. I'll have to give this a try. Ha Ha glad my bee friend liked my bee!! Lisa--- you say the sweetest things ever!! Oh you are so sweet Pallavi!! Fantastic Sonia..I love cards like this and love your cute Bee and trees and all the flowers...fabulous project.. Thank you so much Laurel...I know you like unusual cards just like me!! What a fabulous card - so much detail - just wonderful! Thanks so much for joining our challenge this week at The Sailing Pineapple! gorgeous creation Sonia... love the swing... beautiful flowers... thanks for sharing the tutorial..
i like the quilled red flower and the cool interactive stuff that you put in your creations! Thank you so much Ayesha...the red quilled flowers took so much time to make!! Wow..this is so cool. I luv this. Thank you so much Penny...your sweet words have certainly brightened my day! wow this is such a clever scene! And so very intricate! Love it! What a fantastic card! I love how you make it look easy enough to try! Thank you for sharing your creativity with us! Love the details! They are lucky to have you as a Guest Designer! Kudos to you!!!! I love your projects Melin and am super thrilled you dropped by to write such encouraging words on my blog! I love your work Bibiana and will always support you!! So cute and cheerful. Love the flowers and the bee is just adorable in his little swinging hammock. Ha Ha yes Jani..the little bee sure is enjoying his swing!! Hi Dr Sonia, I haven't passed by for a while but as always you have a fantastic creations. Love how the ladybug swings and that quilled flower is so pretty. Hello, Dr Sonia, I came to your blog through Scrappamondo (volidicarta.blogspot.it). This swinging card is amazing! You used many technique and have a great creativity! Thank you for your tutorial! I'll come and visit you again. So pretty, Sonia! So very pretty! Ha Ha Susan you are making me smile!!! And ha ha yes if I may say so I am a good ENT Surgeon!! Awesome card! This is absolutely adorable! Super cute adorable card...definitely going to try. ..thank you for sharing. .. SO glad you dropped by Daksha...Thank you ! Wow this is a fantastic creation! 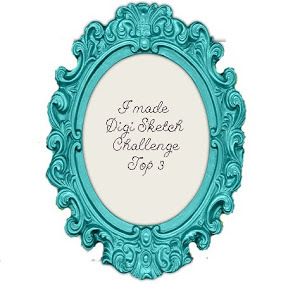 Thank you so much for sharing it with us at Digi Sketch Challenge. Thank you Annemaritta -- ha ha sometimes I make projects just to use up my handmade flowers!! Always such beautiful tutorials ! Hello Sonia , What an awesome card .. !!! This is so lovely...Thank you for joining us at Digi Sketch and good luck. loved it..thanks for sharing..hope to make it soon!!! Fabulous creation, love the image, thanks so much for joining us over at the Sister's of Craft....Good Luck! I'm speechless! So cute kid's card, Dr Sonia!